Tight data capture integration to automate business data export into your enterprise. Laserfiche Enterprise Content Management system accumulates business data from corporate databases, billing and accounting systems, .CSV files or data uploaded manually by employees. Large portions of corporate data are though not there, because they come inside papers, email attachments, scans and image-only files. With ABBYY FlexiCapture add-on for Laserfiche, they automatically appear in the repository for driving deals, better compliance, faster customer service, and more. FlexiCapture for Laserfiche automates the journey of valuable data locked in documents and emails – from arrival to the ECM system – and makes them usable inside corporate workflows. Text and image content is accurately processed no matter the channel, classified by predefined rules or types (agreements, invoices, etc. ), and the key data is extracted directly to Laserfiche repository. Extract complete and accurate data automatically from all types of data couriers and sources. Intelligent data capture and self-learning classification technologies inside FlexiCapture enable transparent and cost efficient data automation for the Laserfiche environment. Fast and direct migration of business-ready data to Laserfiche ECM shortens time to decision making, improves predictability and facilitates revenue. No additional costs on third party localization or verification services: FlexiCapture processes documents in as many as 197 languages. Flexible and customizable, FlexiCapture can handle virtually all document processing scenarios and can be tailored to any company’s workflows and regulations. Scale up easily to process from 100,000 to more than 1 million of pages a day. Documents of different types, structure and content are captured automatically at the point of arrival – MFPs, emails, internal databases or cloud applications. The data is automatically validated to ensure accuracy and compliance. Additional automatic controls help prevent fraudulent transactions. FlexiCapture indexes these documents by types or tags, extracts and exports business-critical data to Laserfiche repositories and workflows. Searchable, ready-to-use documents are stored and accessed easily within Laserfiche Enterprise Content Management system. 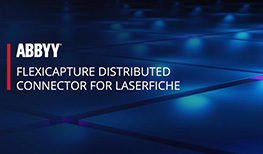 Learn more about ABBYY products that power ABBYY’s Laserfiche solution. Need more info? Just fill in the form below and we will be back to you shortly.